Oil on canvas, 43 x 50 cm. A young dignified woman, along with an older woman and two small children, is thrown on the street by a grim-looking housekeeper, while a plump wife directs the movers in the right direction with their load. It is a detailed, satirical scene that unfolds for the viewer. The work is a good example of Marstrand’s narrative painting with everyday subjects in Copenhagen from before 1836. 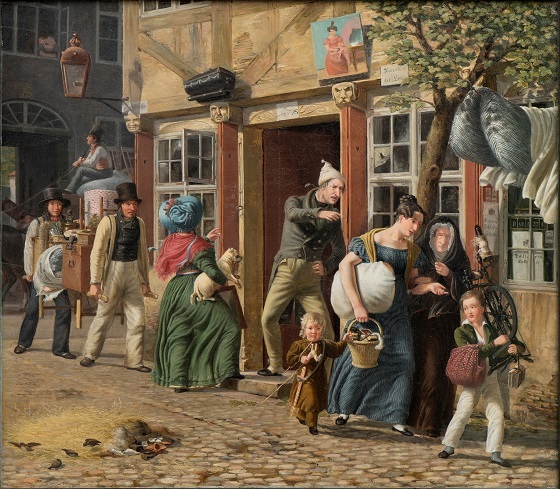 In his moving day scene, he makes ironic comment upon Copenhageners’ constant moving about, and the subject is inspired by Henrik Hertz’s vaudeville The Moving Day from 1828. The artist has assembled the image out of realistic, fantastic and symbolic elements. This helps to give the painting a theatrical look, as if taken from a stage upon which snapshots from everyday Copenhagen in the 1830s are played out.